note: This question addresses the same video and phenomenon described in this answer (which I found after posting this) but here I'm asking for an analysis of the trajectories of the test masses (the astronauts) based on known ISS structure, not accelerations read from sentences in blogposts. 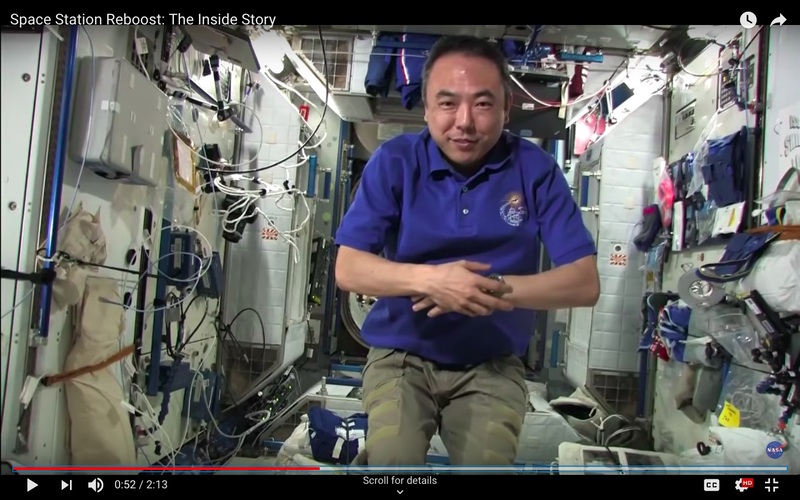 The NASA Johnson YouTube video Space Station Reboost: The Inside Story shows Expedition 29 Flight Engineer Satoshi Furukawa in orbit around the Earth, inside the ISS during a propulsive orbit-boosting maneuver. From the camera's perspective Furukawa appears to be accelerating away from the camera, but it's really the ISS changing velocity. Furukawa's position changes substantially during the video, accelerating from one module to the next. In which direction does Furukawa accelerate; towards the front or the back, and why? Roughly how fast does Furukawa accelerate? I've included two screenshots separated by about 28 seconds, if the distance were 5 meters for example, that would be about 0.013 m/s^2. This requires identification of the two locations and estimating the separation. 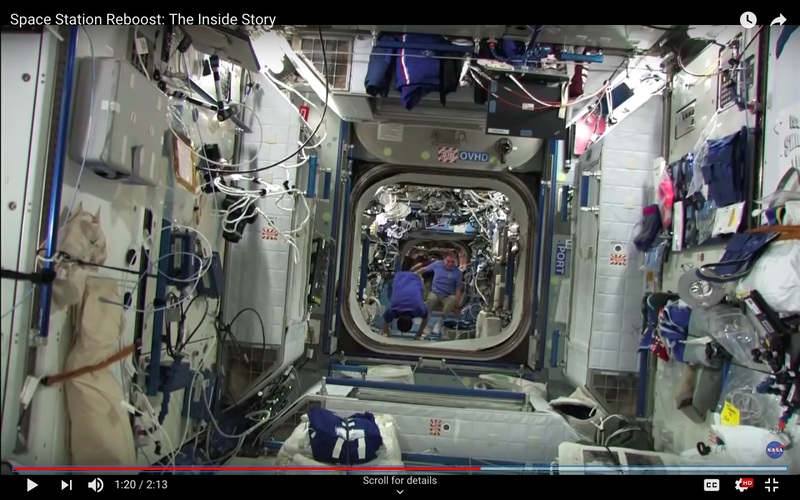 Here's an excellent ISS Virtual Tour to navigate around and estimate distances. They float from Node 2 (Harmony) into the Destiny module - so towards 'aft' of the station. That means the station is propelled from the rear - either by thrusters installed in the Zvezda module or by a Progress spacecraft docked to the rear-most port of Zvezda. (obviously the thrusters are directed 'away' from the station not to spray it with hydrazine, so aft thrusters propel it 'bow forward'). The time in the video is about 28-29s. Using the uniformly accelerated motion calculator we're getting 0.017 m/s^2. Not the answer you're looking for? Browse other questions tagged iss orbital-maneuver microgravity identify-this-object reboost or ask your own question. Do space stations have standardized officer designations for crew? Can a free falling astronaut change his spin and orientation?